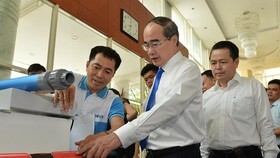 Ho Chi Minh City should strive to boost service development especially tourism to obtain economic growth target this year, said secretary of the city Party Committee Nguyen Thien Nhan. 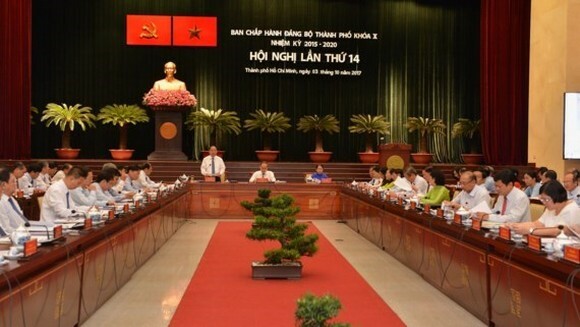 He was speaking at the discussion session of the 14th conference of the executive board of the HCMC Party Committee yesterday. According to Mr. Nhan, although the city posted year on year gross regional domestic product (GRDP) growth rate during the first nine months this year, it will have to overcome big challenges in the rest three months this year to obtaint its targets. 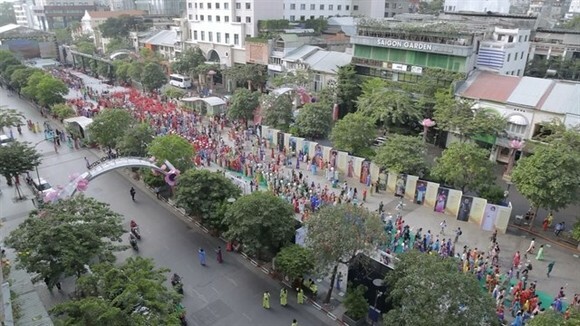 In the rest three months, Mr. Nhan said that the city should boost service development especially tourism by improving tourist programs, ensuring safety for visitors and keeping street order and organizing cultural activities in the upcoming Tet holidays. In addition, relevant agencies should continue good market management, preventing trade frauds and ensuring food safety. 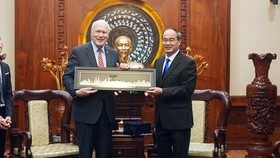 He also urged implementation of infrastructure projects for economic development and HCMC financial hub project in Thu Thiem New Urban Area. He proposed relevant sides to carry out environmental, traffic and urban planning projects more drastically because they are being conducted more slowly than other key programs of the city. District leaders should review construction situation in their localities and consider regulations and plans in the field to reduce illegal construction. Districts inner the city should strive to restore street order with specific plans and rectify road encroachment according to practice to stabilize residents’ lives. He required to estimate the impact of administrative reform to residents and businesses. The city will focus on supervising administrative reform and businesses and residents’ satisfaction about that in October and November. A symposium on administrative reform of the city People’s Council will be held to inform the actual state of the activity to have timely adjustments to better serve residents and investors. At the conference, director of HCMC Cadre Academy (HCA) Tran Hoang Ngan said that HCMC should propose the Central Government to permit transfer of over 100,000 hectares of agricultural land into industry and service purposes. According to Mr. Ngan, the issue of land management and use has been most reflected. That is the hottest one now, leading to land encroachment, illegal construction and residents’ complaints. While the area for industry and service is too little, a large area of agricultural land has been left fallow or used insufficiently. 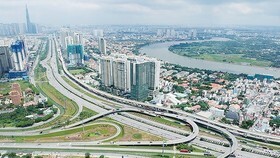 That has affected the development of economic industries and slowed down HCMC’s growth target. Mr. Ngan said that the city needs to have breakthrough policies in the field to create the best conditions for residents to use land efficiently aiming to increase revenue from land use fee collection. “We have kept saying that land is gold and important resource for development. 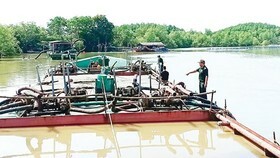 However, the city has yet to have solutions and policies to make it better,” said Mr. Ngan. 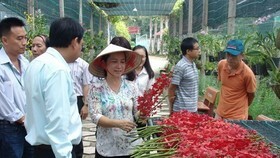 Relating to land, secretary of Hoc Mon district’s Party Committee Nguyen Cu stated some land problems in the district. In many areas, land barons and residents have opened roads on their own initiative, divided land parcels into smaller lots and conducted illegal transfers in agricultural land. 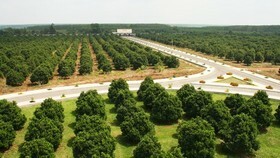 The district has spotted 160 hectares of agricultural land which have been changed into housing land adding that it is a serious problem breaking land management regulations and plans, showing signs of group benefits with the support of land barons and needs to be investigated to make clear the issue. Head of HCMC Export Processing and Industrial Zone Authority (Hepza) Nguyen Hoang Nang suggested also that the city should have solutions and preferential policies to boost capital attraction instead of doing at by movement as present. Besides, the city should focus on sustainable investment in added value and field connectivity, give priority to traffic infrastructure and services at industrial zones. Land price and traffic infrastructure are two factors which the city has lost precedence over other localities in the southern region so the city has not lured much investment projects as expected. The ratio of land use for industry is too low reaching 4,000 hectare while the Government has approved a plan of 8,000 hectares. The remaining area has been stuck with site clearance. 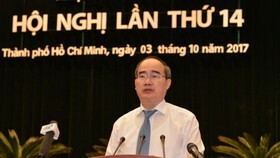 Director of the Department of Finance Phan Thi Thang said that land use revenue was relatively good since early this year. Export import revenue topped 70 percent. However it has still not met requirements compared to norms assigned by the central government. Taxation, customs and finance industries have made efforts in carrying out solutions to raise revenue. However it still needs the entire political system to join hands with the main revenue being domestic sources. 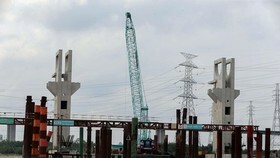 Reporting construction conditions, director of the Department of Construction Tran Trong Tuan said that 22,830 works started constructions during the first nine months this year. Relevant agencies spotted 2,000 cases breaking regulations in the field and 16 out of 24 districts saw illegal construction increase. The number of granted construction licenses was also on the rise. 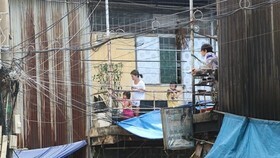 Many years ago, Binh Chanh district took the lead in illegal construction. The issue has reduced in the district but strongly hiked in Cu Chi and Can Gio districts. In the upcoming time, the city People’s Committee should issue an instruction to intensify urban management in the city with many solutions to rectify illegal construction. Responsibilities of agency leaders including construction and urban order inspectors in districts, wards and communes should be increased.